On the 18th (Thu), wander the streets of The Strip. For reviews, more things to do, where to stay, and tourist information, you can read our Las Vegas day trip planner. Santa Clara to Las Vegas is an approximately 3.5-hour flight. You can also do a combination of train and flight; or drive. In April, Las Vegas is somewhat warmer than Santa Clara - with highs of 80°F and lows of 57°F. Wrap up your sightseeing on the 19th (Fri) early enough to travel to Grand Canyon National Park. 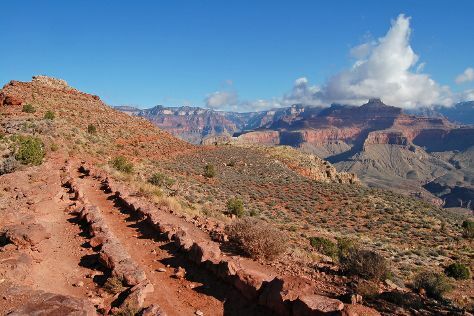 Kick off your visit on the 20th (Sat): tour the pleasant surroundings at South Kaibab Trail, take in breathtaking views at Grand Canyon South Rim, and then don't miss a visit to Powell Point. Keep things going the next day: get great views at Yaki Point, then take some stellar pictures from Lookout Studio, and then examine the collection at Kolb Studio. To see ratings, photos, traveler tips, and other tourist information, you can read our Grand Canyon National Park day trip planning website . Traveling by combination of car and flight from Las Vegas to Grand Canyon National Park takes 4.5 hours. Alternatively, you can drive; or take a shuttle. Traveling from Las Vegas to Grand Canyon National Park, you'll lose 1 hour due to the time zone difference. While traveling from Las Vegas, expect a bit cooler days and colder nights in Grand Canyon National Park, ranging from highs of 62°F to lows of 26°F. Cap off your sightseeing on the 21st (Sun) early enough to go by car back home.